October 23rd in Social Media, Wordpress Plugins by Wordpress Jedi . Those of you who follow Mashable have probably seen its velocity graphs and social sharing buttons in the past. We have already covered various plugins you can use to add similar looking social media buttons to your site. 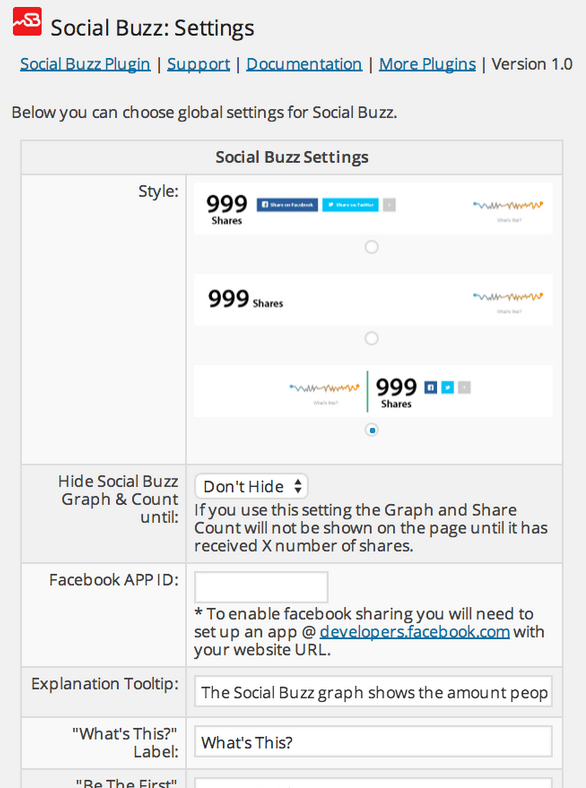 Social Buzz happens to be a cool plugin that not only offers attractive buttons but also displays a shares graph on your site. The plugin is easy to customize. You get 3 styles to choose from. The buttons work on pages and posts. The design is responsive. You do have the option to hide the graph and count until your posts reach a certain number of shares. You will need to set up an app to enable Facebook sharing. The plugin makes it easy to customize labels, update frequency, and other minor settings. Social Buzz looks pretty decent and might encourage your visitors to share your articles more. I personally don’t like cloning features that other sites offer, but if you don’t mind, you may want to give Social Buzz a look.